What changes? Does the PDF alter the document in any way? If so, it's a serious bug. If nothing is altered the apperance of the dialog is a minor bug that should also be sorted out since it's confusing. 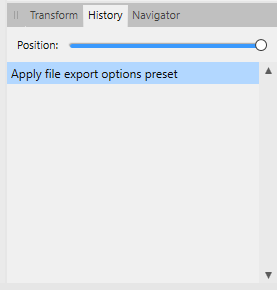 Opening the document and closing it without export does not spawn a dialog. The export options are saved with the document when the document is exported. It looks like this happens even if they are not changed, which could be improved. You can get a basic idea of what changed from the History panel. Basically (I think) if you have History entries since the last Save you'll be prompted to Save when you try to close the document. That behavior is consistent with some other applications I've used. For example, opening a LibreOffice document and printing it will cause a similar prompt when you try to close it. ...That behavior is consistent with some other applications I've used. For example, opening a LibreOffice document and printing it will cause a similar prompt when you try to close it. That never happens to me. I open various shipping label files every day, print some sheets and exit without getting prompted. If I change printers, then I do, but not just opening and printing to the last used printer. I can confirm that the same happens in MS Word (2016 at least). If you save a document file, save a PDF of it, then close the program, you'll be prompted to save changes. I'm pretty sure that nothing in the visual document itself changes just, as AdamW states, some of the data behind the document (probably PDF preferences). I find it surprising that the last used export settings are a property of the document. I can't recall seeing that anywhere else. But while we are at it this brings me to an idea: I can think of presets saved into the document and use them as a batch export. In my use case currently I export three versions of my document (using presets): A backup version (no rasterisation, no downsampling), a print version (rasterized, 300 dpi) and a preview one (100 dpi, optimized for sending it over mail). A single click to export all three and using the preset name as suffix would be nice. Sounds like something you might want to post as a feature request over in Discussions and Suggestions for Affinity Publisher Beta on Desktop. Thanks. I always forget that there is a History panel. And you're absolutely right. I has an entry for that. No, this is not what happens. I just tested it with MS Word 2016 on my site. Changing PDF options on an export do not alter the document and there is no save prompt. Can you please double-check that or tell me what exactly you did? I checked the "PFA/A compatiblity" option in the PDF export settings for my test.